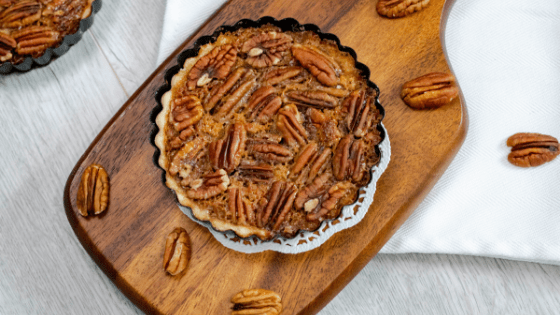 These Easy Mini Pecan Pies are packed full nutty and delicious flavor. This recipe can be easily made into a regular size pie. Melting the syrups and sugars together is essential to making a flavorful and well-incorporated pie. By melting the ingredients together on the stove top, it allows them to become one very flavorful syrup mixture. After adding the vanilla in, the kitchen smells with the very familiar scent of homemade pecan pie. You’ll know when you’re off to a great start! You can easily make a regular sized pie with this recipe. Instead of breaking the pie crust dough into 6 balls, simply roll the dough into just one ball, flatten it out into a disc and refrigerate and proceed with the rest of the recipe. After the pies have cooled, you can slide the pies into plastic treat bags and tie them off with a cute ribbon and name tag. Everyone loves a tasty homemade treat as a gift! These easy mini pecan pies are packed full of flavor. This recipe can easily be made to make a full pie. Combine flour, salt, and sugar in medium bowl. Cut in cold and sliced butter and blend until broken into bits. Add in water 1 tbsp at a time until dough is workable. Divide dough into 6 balls and flatten out into discs. Cover and refrigerate while making pecan filling. In a medium saucepan, combine sugars and syrups together over low heat until melted. Add in butter and stir until melted. Once the mixture is foamy, add in eggs and stir until the eggs are broken up and mixed well. Take dough out of the refrigerator and roll out to fit mini pie tins. Layer pecans in bottom of pie crusts. Fill pie crusts with pie filling until 3/4 of the way full. Top pecan pie filling with pecans if desired. Bake for about 25-35 minutes depending on oven. Pies should be set around the edges and slightly jiggly in the middle. Let pies cool for about an hour and a half to allow pie to set. These look absolutely amazing! Pecan pie is my fave and I’m totally going to attempt this!